This week's One Layer Challenge is being hosted by Heather. It's called Tall and Thin, which made me laugh. Tall and thin is something I've spent some time in my life aspiring to, but it's too late for tall, and food's too good for thin! I try to focus on healthy food, lots of exercise (walking) and occasional treats and not to worry about it too much beyond that! The trouble with oddly sized or shaped cards is finding a matching envelope. But I think I found a solution. This card is not actually tall - it's 5.5" so it will fit into a standard envelope. But it is thin - 3". So I've created the illusion of tall and thin! I know, I know, you can hardly stand my brilliance, right? lol! 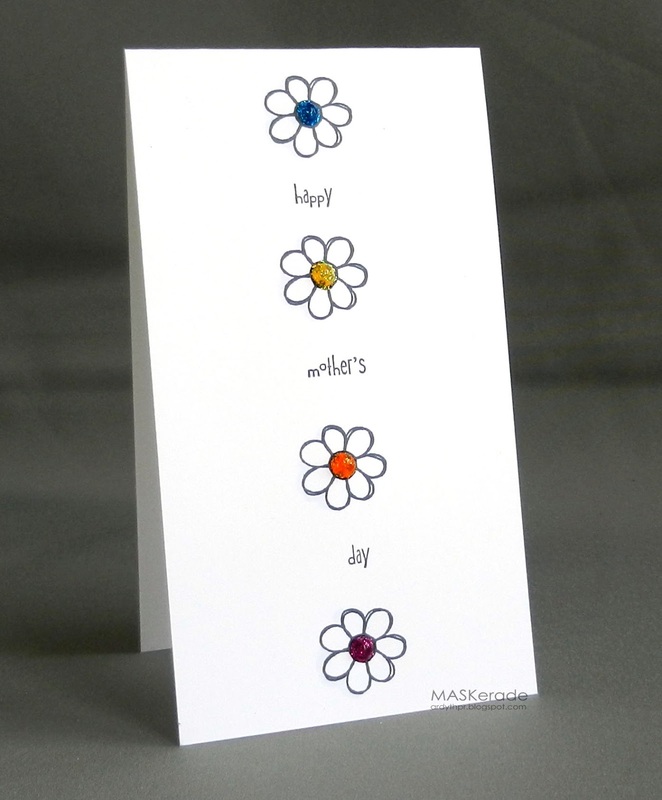 Very simply stamped with (I think) a Gina K flower and an old Rubber Soul sentiment. The flower centres are filled to the brim with Stickles for some dimension and sparkle. Ardyth, another fabby card. I love that you turned it into an adorable Mother's Day card, so sweet and you would never know that it was only 5 inches tall. Too cute. Neat card! Like the simple, line work daisies with the thick Stickles centers. :) I have used standard #10 (9.5 x 4.125) business eps for tall and thin cards. great idea - love that you kept the length at 5.5". Fabulous design as always. That was a clever trick ... all about illusions. Cute card. Yes, it is brilliant - the optical illusion, the design and the bling!! Had to look twice because I thought the Stickles were actual rhinestones....nice steady touch girl! Love this fun card, Ardyth! Hope I can find some time to play with this challenge. Ardyth I love your tall and thin card, yummy for sure! You really fooled this old eye. I definitely thought it was bigger. I ordered what are called Monarch envelopes from an online company. They are for cards that are 3.5 by 7. So smart! I hate finding envelopes for the odd sizes. You are brilliant!!! I love these sweet flowers, Ardyth! I like your thinking. If I lost about 6" in width, maybe I'd look tall. Mmm! I like the treats too much I'm afraid! I hope you get to play at QFTD, but if you don't I certainly understand. Most days there's hardly time to take a deep breath! LOVE it! Wonderful card, Ardyth! You matched your design perfectly to the shape of the card. Little words and big sparkles. Lovely.